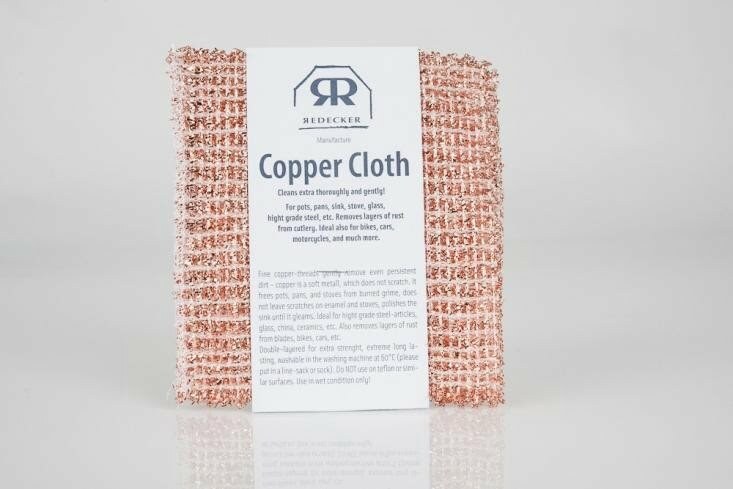 The copper cloth cleans pots, pans, sinks, ovens, ceramic cooktops, glass, stainless steel, etc. thoroughly and gently. The copper cloth cleans pots, pans, sinks, ovens, ceramic cooktops, glass, stainless steel, etc. thoroughly and gently. Perfect for removing rust. Ideal for all shiny parts of bicycles and motorcycles, as well as for glass and chrome parts and aluminum rims on cars. How it works – Fine copper threads loosen even the most stubborn dirt carefully because copper is a soft metal that is non-abrasive. Brilliant for a brilliantly shiny sink! NB – wet copper cloth before use! Care of your copper cloth – The two-ply material is extremely durable and is machine-washable in warm water (up to 60 degrees Celsius). Ideally place in a net bag or sock when washing. Not suitable for Teflon or other non-stick surfaces. Environmentally compatible, 100% recyclable.